In full flower this month the plant in our arid house has two flower spikes as high as the example shown here in the wild. As the flower spike extends it is the fastest growing plant tissue in the world and has been recorded as growing 3.65 metres (12 foot) in 14 days! 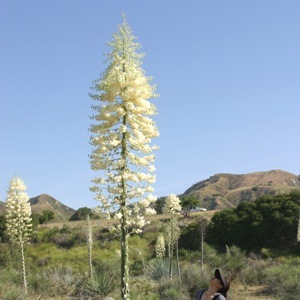 The candle yucca eventually produces creamy white flowers at the top of this flower spike. The rosette of leaves at the base of the flower spike are exhausted by this effort and gradually fade away leaving a cluster of new baby rosettes to continue the life of the plant. The fruits can be eaten and the seeds roasted and eaten as well, so it is useful as well as being a record breaker. Most memorable is however the painfully sharp hard woody leaves. These give the plant its most descriptive and vindictive of common names – Spanish dagger!